Some weeks ago, our Senate approved a very restrictive law against tobacco. It includes the prohibition to smoke in public places and the obligation that half of all cigarette advertising (and half of each cigarette package) must include this advice. It shows a man who lost his larynx because of cancer and the phrase "Attention! These cigarettes are killing you". VERY SMART INDEED! Good message! Just curious "Ed"...do your cig packages carry the warning that smoking causes cancer? 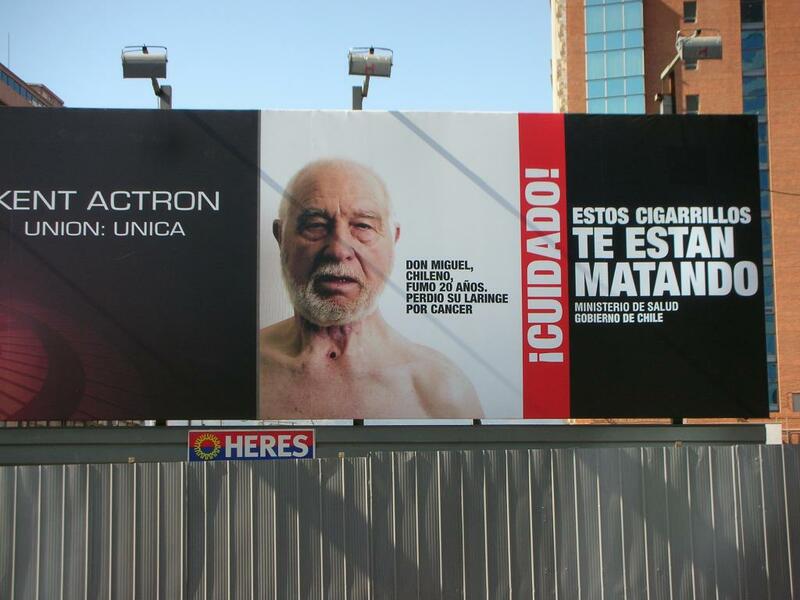 We have similar ads here...even one lady on tv who talks about having a permanent "trach" (airway hole in her neck like that man on the billboard) and you know what? At the end of the piece she even sticks the cigarette in her neck and inhales THAT WAY! Can you beLIEVE it? cela commence a venir dans tous les pays. depuis longtemps en France, sur les paquets de cigarettes, il est inscrit en GROS 'Fumer tue'. En Fevrier, interdiction totale de fumer dans les lieux publics. c'est donc un combat universel. that starts has to come in all the countries. for a long time in France, on the packages of cigarettes, it is registered approximately “Smoke kills”. In February, total prohibition to smoke in the public places. it is thus a universal combat. Yes it is a universal war. Smoking does kill and as a non- smoker I really am glad to not be inhaling sombody's cigarette in an enclosed place, especially a restaurant. In China, no cigarette ads now. but people still smoke everywhere, when i saw some youth smoking....really wanted to go and tell them the disadvantages of smoking. Que bien que extranjeros (por lo que entiendo) muestren el pais y lo lindo que puede llegar a ser si se le sabe enfocar. Estré atento a tus fotos. Ame: Yes, the package carry thesame warning. To be fully effective, it requires a lw which mandates a variety of warnings [and illustrations] because the constant repetition of the same message isn't as psychologically effective as what can be achieved by varying it.